Since the last time I published this blog a lot has happened in the world! A LOT!! I can’t cover everything, so let’s just focus on the last few months. There have been a disturbing number of assaults, abuses and even murders of unarmed Black men and women at the hands of law enforcement officials lately. Protests sprang up around the country. This country’s painful racial wounds have been laid bare once again. “You cannot ERASE what you will not FACE.” -Ejay Moore 9 people were gunned down in an historically significant Black church. The kkk has a rally planned for South Carolina and Southerners are holding on to the Confederate flag for dear life. Black churches are being set ablaze across the South. The President used the ‘n’ word in a podcast interview to make a point. The Voting Rights Act was struck down because ‘we live in a post-racial America’, even as states tried to figure out ways to further distance black and brown voters. Yeah, our ugliness has really been showing as of late. Ugly. Ugly. Ugly. Now, you may be saying, “What gives, Ejay Moore? 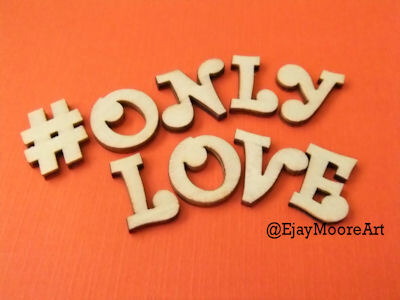 Why is this post titled ‘Only Love’ and all you’re talking about is the opposite?” Well, dear reader, I’m getting to it. One morning, I was feeling particularly hurt and angry about all the racist tomfoolery going on in our country and I made the mistake of going to the grocery store. Let me explain. I (thankfully) live in an ethnically diverse neighborhood. I have neighbors from all backgrounds, races, faiths, yadda yadda yadda. Normally, this is not a problem for me at all. However, this particular day, I was really feeling kinda raw about the whole race ‘thing’. I was irritated with every white person I encountered that morning. All these hateful thoughts about ‘them’ ran through my mind at every turn. Now, INTELLECTUALLY and SPIRITUALLY I knew that these specific white people had not done a single thing to incur my wrath. I had not seen the lady reaching over me to get to the yogurt on Fox News spewing hate speech. No, she was just a lady trying to get to her Greek yogurt. She smiled and said, ‘Excuse me’ and that irritated me even more. As I said, intellectually and spiritually I knew she did nothing wrong, but EMOTIONALLY I was all fucked up about her even being there. Like how dare she be out shopping and being happy when Black folks are dying in the streets like dogs? Look, I know how crazy it sounds. I’m being honest about it. So, I finished what arguably was the strangest, most emotional grocery shopping of my life and got the hell out of there. After I loaded my purchases into my car, I sat there for a minute and very clearly, I mean, VERY CLEARLY I heard, ‘There is only love, Ejay.’ I was not in the heart space to take in that message at that time, but it just replayed over and over in my head like the chorus of ‘Shake it Off’ by Taylor Swift (now you’ve got that playing in your head, don’t you? lol). 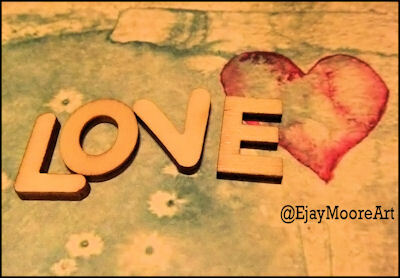 ‘There is only love, Ejay.’ Over and over it repeated until I really got it and felt it. Once I allowed myself to feel that statement, I got the intuitive hit to take as many pictures of the word ‘LOVE’ as I could and pair them with the hashtag ONLYLOVE. One of my favorite quotes by Dr. Martin Luther King, Jr. is below. 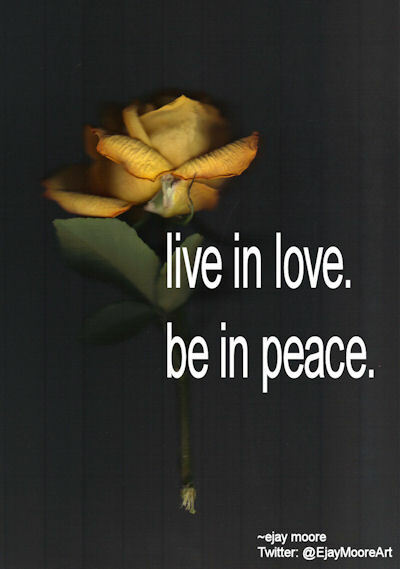 So, I’m going to use my space on the Internet to promote LOVE and only LOVE. Does that mean I won’t get pissed off at the failings of my government, myself and my fellow Americans? Nope, it just means I’m going to post love more than ‘other’. Only Love, y’all. Only love.